With these Fiji holidays, not only can you save up to $1,750 per person but up to three kids under 12 stay and eat for free. 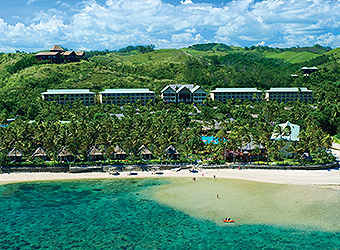 For a fun family holiday with lots to do, stay at Plantation Island Resort, the Radisson Blu Resort Fiji or the Outrigger Fiji Beach Resort with activities such as kayaking, scuba diving and more. Enjoy reduced rates, food and beverage credits, babysitting, massages and more. To go where happiness finds you, call your personal travel manager about these great Fiji deals. 8 days | 7 nights from $1,130*pp. 8 days | 7 nights from $1,130*pp. Reduced rates, food and beverage credit, babysitting and more - save $915*pp. Offer expires 31 Mar 2019. 7 days | 6 nights from $1,520*pp. Reduced rates, all meals and more - save $655*pp. Offer expires 31 Mar 2019. 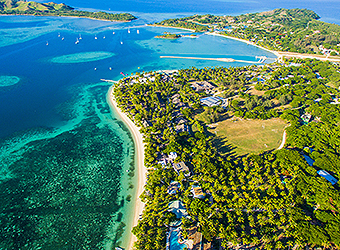 With white sand, clear waters and activities to suit every interest, Fiji promises a holiday experience that you’ll never forget. Whether you’re planning a romantic couple’s escape or a fun-filled family getaway, we’ve put together an introduction to Fiji’s different regions to get you started.